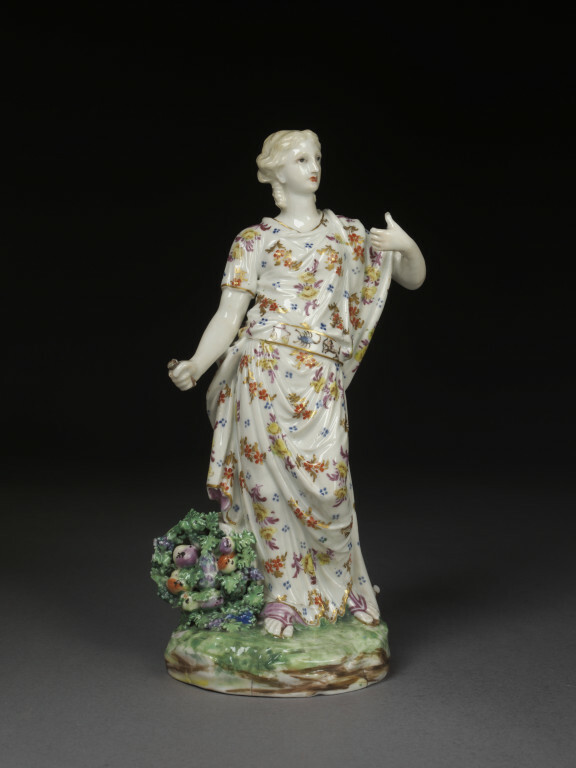 Figure, in hard-paste porcelain painted in enamels and gilded, of Autumn represented by a woman with a sickle and ears of corn in her hands and an overturned basket of fruit is at her feet; she wears a pink-lined mantle over a loose robe, both diapered with flowers and gold, a belt with the zodiac signs, and purple sandals; she stands on an irregularly shaped base. One from a set of the Four Seasons 414:730/ to C-1885 (Sch. I 742 to C). 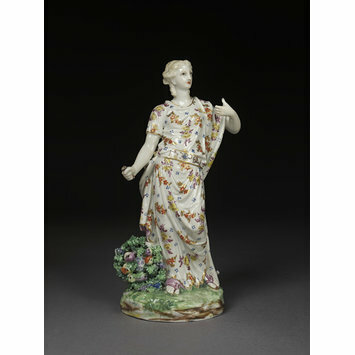 Figure, in hard-paste porcelain painted in enamels and gilded, of Autumn represented by a woman, made by Bristol porcelain factory, Bristol, modelled 1772-1775.